BRAND: OptiSource All Off Marking Ink Remover 1 OZ. The All Off Marking Ink Remover is safer than caustic Acetone and will never ruin a Polycarbonate Lens. It instantly dissolves and removes any progressive ink markings with the industry's most widely used solution. Simply apply with a swab, cloth or even dip into solution for 2 seconds. All Off Marking Ink Remover is used by more labs than any other marking ink remover in the world. 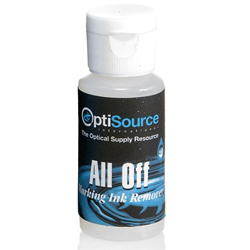 All Off is our customers' choice for ink removal and it is no wonder why it is the winner of the OPTICAL Laboratories Association Award of Excellence.